Our household was recently part of the Local Harvest Challenge where for a week we attempted to be ‘ultra’ intentional about our food choices and eat food that hadn’t traveled too far to get to us. In preparing for the week, we did an inventory of what we presently had on the pantry shelves and found some items had gone some distance. Instant noodles from Malaysia (6,365kms), chilli sauce from Thailand (7,366kms), and baked beans from Italy (15,960kms). So what is eating locally? What’s local for me in Melbourne’s urban west will be different to what’s local for my distant neighbour living in Broome, WA. There will be different things available in each area and different possible steps to take in reclaiming your food choices. First up, and thinking broadly, simply buying Australian grown produce or products, rather than imported is a significant step in eating more locally. In fact, with processed foods (‘food’ available in supermarkets), often the only meaningful information available on the product label is Country of Origin labeling. This refers to where the ingredients are put together or from. ’Product of Australia‘ means both ingredients and processing happen in Australia; ‘Made in Australia‘ means at least 50 per cent of the transformation or production costs happen here; ‘Made in Australia from local and imported ingredients‘ indicate if local or imported components are greater (whichever is listed first). In the Food Miles in Australia report by CERES, an average shopping basket of 29 common food items traveled over 70,000 kms — that’s nearly two times the distance around the Earth. Just four imported items accounted for nearly 50,000 kms. So you can make a significant difference by choosing items labeled in this way over imported items. 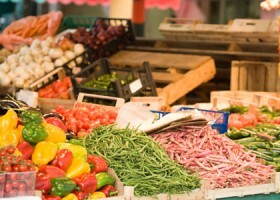 There is an abundance of fresh food produce available in Australia, and most likely close to you. You’ll find some is labeled but for specifics of where it’s from you’ll often need to have a conversation with the retailer. This won’t be hard as they love talking about their produce! There is a growing movement of people who are buying direct and cutting out the middle man. Farmer’s markets, community box systems, sales from the farm gate are all ways to more directly connect with the farmer and find out about good produce and the processes behind it. Our household presently get fruit and vegetables through the Western Organic Collective, a food coop consisting of 25 households where we together source organic produce from the metro market, paying $20 a week for an organic box. Food Connect and CERES Fairfood are two other box-buying systems, based on a ‘Community Supported Agriculture’ (CSA) model. The Local Harvest website, launched in February 2012, has come about with the recognition that there are many of these resources around the country but often difficult to find. At the website you can put in your postcode and see good food options close to you. Supporting farmers and producers directly is putting money back into the local community. We’ve been getting our eggs from the Melton CSA farm while our backyard chickens are on winter-egg-break. The farm is 40kms west of our home and Carey who runs it has an ingenious and awesome chook tractor that is like a portable home for his girls. We’ve been able to visit and get involved. We know the conditions in which the chickens are kept and who our dollars go to support. (If buying supermarket eggs, you can look for free range from a farm close to you). It’s worth noting that although supermarkets give us access to all food types all year around, all food has a season of production. Buying local food keeps us in touch with the seasons. By eating with the seasons, we are eating foods when they are at their most flavoursome, are the most abundant, and the least expensive. 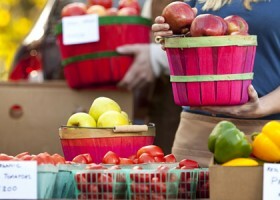 Your local farmer’s market or farm-gate has produce picked within 24 hours of your purchase. This freshness not only affects the taste of your food, but the nutritional value too. See more about the journey of a tomato here. Of course the most satisfying experience, and one where you are most connected with your food, is growing your own. There’s not even many ‘food-metres’ for a lemon from your own tree. Start small if this is new to you. Try herbs or things that are likely to take off. We have an endless supply of silverbeet that seems to continually self-seed. This article originally appeared in Green Lifestyle and is reproduced here with their permission. For more great stories, visit Green Lifestyle Online.